Henderson County was the focus on Saturday and Sunday, May 31 and June 1st for the Hunting Retriever Club, a member of the Mississippi Flyway Hunting Club's Licensed Hunt Test. Now, I knew nothing about this activity but have owned and do love Labrador retrievers and they are really smart dogs as well as an all around family member. A licensed hunt has three levels: 1. Started, 2. Seasoned, and 3. Finished. As the levels goes up the test becomes harder and more amazing. In Started, the dog is on leash, a gun is fired and a target thrown on the ground. The dog must find it, bring it back and hand it to the owner. The same procedure is followed by repeating the scenario on the water. In Seasoned, a shot is fired and target thrown and then a second shot and target follow. In this class the dog must retrieve the second one too. Then a blind test is conducted. Again, the same thing is performed with the targets landing in water. In Finished, it is even harder with three shots fired and 3 targets used on land and water. In addition in this class, once the dog finishes the course, it must move over, sit down and watch the next dog perform-not moving. Wow! That is really, really hard for these breeds who want to work. About 80 dogs and 100 people from all walks of life and many states as well as Illinois enjoyed two days of testing their dogs on the farm land of Ken & Sara Nimrick, Craig and Diana Taylor, Kevin and Connie Burgdorf and the Pogue land rented by Barry and Jodi Bigger. Paying an entry fee of $50 for started, $60 for seasoned, and $70 for finished, owners and breeders pulled into the pastures and pond areas to see what their dogs could do. This is not a competition but a test judging to a standard of the dogs' ability. With Bill Ackman as our guide, Margaret Boyce and I hopped aboard a Gator and were transported to a Started Test on a pond. Here the handler and dog go down to the water's edge, the handler sounds a duck call, a target is released and the handler fires a shot and then a second target is released followed by a shot. Now the dog jumps into the water and retrieves one after the other separately and delivers them back to the handler. Two judges assess the dog's ability and give it a score. These are young dogs and they just love water! It's as if they are saying, " Yippee! Water, water-here I come." Next, we moved to the Seasoned area on another pond. Again, two shots, two targets which the dogs may retrieve in any order and one blind. Here the handler and dog who had just completed their test must move aside and sit there while the next dog and handler performs. 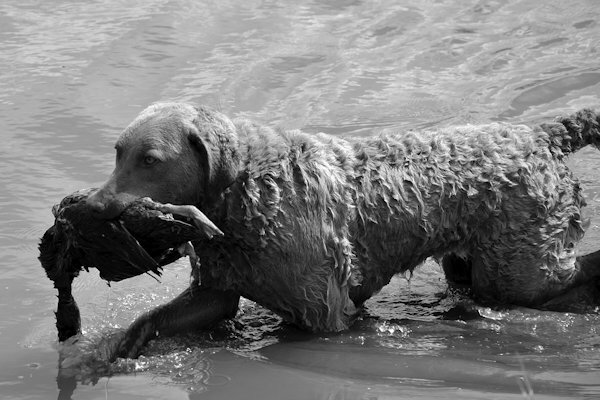 Now this is really tough for a retriever who wants to work and loves water-incredible control on the dog's part. At this location, we met Sarah Harris from Mills County, Iowa, who began training dogs when she was 4 years old and started participating in Hunt Test at 7 years. She will be a freshman in high school next fall. She had two Boykin Spaniels (finished and started) and spends at least one hour day training after school and softball practice. When asked whether she will continue this as her high school years, she said, "I love my dogs!" On to the location of a Finished water class were lots of pickups with dog boxes on the back as well as fancy trailers lined up in the field. When I asked Kenny Stutsman from Burlington, IA, about how much a dog trailer might cost, he said they usually figure $2,000-3,000 per hole so one can go low budget or jump in a range of $6,000-$100,000. Yes, those figures are correct! David James from Lovington, Il., who trains dogs professionally, participates in AKC and UKC Hunt test as well as providing a stud service, was glad to take part and encourages participation in the sport. In Finished, three targets are retrieved with the last being what is called a Blind Retrieve. In this test a duck is place across the pond at a location and the handler must direct the dog using hand signals, whistle or verbal clues. All retrieving completed the handler and dog move aside to the "honor bucket" to watch the next dog perform. The judge pointed out safety is emphasized for both dog and handler and both are evaluated on it. He discussed the importance of building a bond of trust through training between handler and dog. He pointed out that an overcast sky or foggy conditions make spotting the target more difficult. Noontime arrived and Fisher's Food Center, Bryan and Abbey Hubbard, were on hand with hamburgers, hot dogs, steak sandwiches, potato chips, cookies and pop. Thanks for the great food. While chomping on a hamburger, I visited with Jim Caughey, a judge for 10 years who judges in Wisconsin, Iowa and Illinois. He emphasized this is a family sport; it is enjoyed by people from 4 years (as Sarah) to 80 years; goals are attained and the outdoors appreciated. Jodi explained the Hunt Retrievers' Club has 40 members and has a nationwide youth program whereby an interested youngster writes an essay on "why he wants a dog" and if chosen he is given one to train. Some scholarships are available too. Noontime was also the time to collect ribbons; on Saturday 23 out 30 dogs completed the licensed test. One dog, owned by Krissy Evans of Springfield, qualified as a Titled Dog-2 year old dog that had 4 passes in Hunt Test. Her fellow handlers initiated her with cold water-a tradition. She said, "I can really celebrate-a Titled dog plus 19 puppies at home." Yes, they are for sale. Back to the field to see the Seasoned water test. Here the dog retrieves two targets and one blind. The last is about 40 yards from where the dog and handler are standing and by hand, whistle or verbal the dog is guided to the bird across the pond. Judges Pat Addis and Russell Harris were on hand to score each pair. What a great group of people from all walks of life who genuinely welcomed us and shared their love of the sport. Labador Retrievers, Nova Scotia Duck Trolling Retrievers, Golden Retrievers, Boykin Spaniels, Cheaspeake Retrievers, Water Spaniels plus possibly other breeds made an appearance here in Henderson County and this was a big event! You missed a chance to experience a remarkable demonstration of smart dogs, results of hours of training and an example of the love between owner and dog. If it is held here next year, be sure to mark it on your calendar and attend. You will be amazed!